Dr. Rupa Iyer has successfully developed and integrated an interdisciplinary research-based modular laboratory curriculum within the biotechnology program at the University of Houston (UH) (Figure 1). Three sets of activity modules utilize a guided inquiry-based method to take students through the process of scientific discovery and investigation to and to follow its applications in the real world. Module I representing the Nature component of the curriculum is an environmental sampling research module (ESRM), which demonstrates the discovery process and consists of the collection of environmental soil samples to isolate organophosphosphate-degrading microbes. As an investigative/discovery module that provides research experiences, students are directed to collect a soil sample and record the date, time, and location of the sample. The sample is then processed in the laboratory following a protocol to enrich and isolate OP hydrolyzing bacteria. Students then enter their research project data to pinpoint the location of pesticide degrading activity on a map using a Google location module. Module II or the Laboratory component introduces techniques that include isolating, cloning, and transgenic expression of the OP-degrading gene. The aim of this module is to demonstrate the research activities that are normally conducted following a discovery with a potential commercial application. Finally, module III or the Production component consists of activities that emulate production of a biotech product; in this case activities that are related to growing transformed cells in a bioreactor for optimum production, which is then followed by purification of the recombinant protein using traditional downstream processes. All three modules are part of the undergraduate biotechnology degree program and have been successfully integrated over the past seven years into biotechnology laboratory courses at UH. In the near future we plan to develop the ESRM component of our modular curriculum into a scalable and sustainable learning product in collaboration with other institutions. This initiative, which we refer to as the Global Education and Research Collaboration or GERC, is outlined below in Figure 2. What makes GERC possible is that the content and flexibility of the ESRM is ideal for integration into a variety of courses at different levels of an undergraduate curriculum. Using the UH curriculum as a model, partnering local, national, and global institutions would adopt the ESRM into their biological sciences curricula and thereby broaden student participation in undergraduate research experiences, while also contributing data to the student generated database begun by UH students. Adding as much data to the existing database factors heavily into our vison of uniting our research with education. The geographic and bioinformatics data we collect is not simply compiled for publication. It is also used as the basis for several undergraduate STEM learning activities and to promote multiple outreach and training efforts. An outline of our current platform depicting how this process works is shown in Figure 3. In summary, the basic research conducted on putative degraders generates the raw data for further enhancement of student STEM skills, namely critical thinking, problem solving, quantitative literacy, and communication. STEM activities may be simple such as statistical analysis between isolates collected at different times of the year to more advanced analyses that combine different forms of data (geographic, genomic, proteomic, degradative) to draw specific conclusions on trends in xenobiotic deposition or identify critical binding sites for enzyme catalysis. 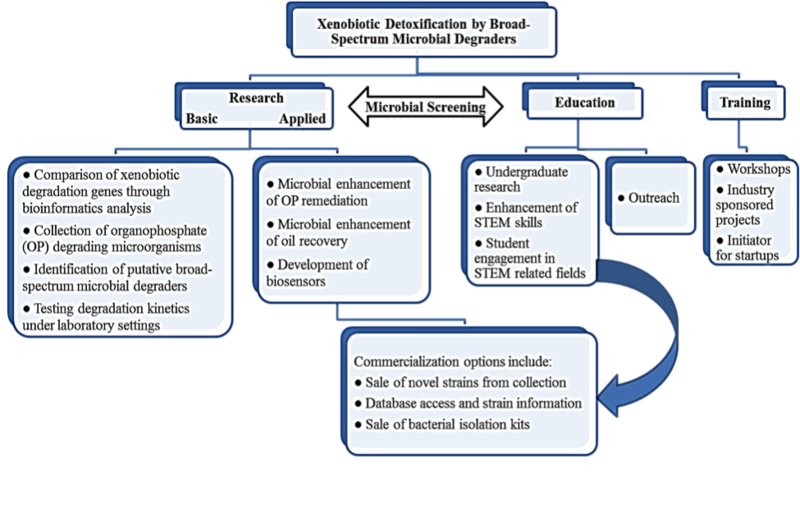 In addition, this data also serves as a precursor for larger, applied projects in the field of bioremediation with commercial applications. It can even be utilized in various outreach initiatives or provided to industrial collaborators for educational, training, or commercial purposes as needed. Iyer, R., Smith, K., Kudrle, B., and Leon, A. (2015). Detection and Location of OP-degrading Activity: A model to Integrate Education and Research. New Biotechnology. Vol. 32(4), 403-411. Iyer, R., Wales, M. (2012) "Integrating Interdisciplinary Research-based Experiences in Biotechnology Laboratories", Journal of Advances in Engineering Education, Vol. 3 (1) 1-35. Iyer, R., Kudrle, B. (2012) "Implementation of an Electronic Lab Notebook to Integrate Research and Education in Biotechnology Program", Technology Interface Journal, Vol. 12 (2), 5-12. Kudrle, B., Iyer, R. (2012) "A Semantic Lab Notebook for Education", Computers in Education Journal, Vol.22 (3). Iyer, R., Fitzgibbon, W. E. (2009). Building the future biotechnology workforce: A University of Houston model. Journal of Commercial Biotechnology, 15(2), 171-182.